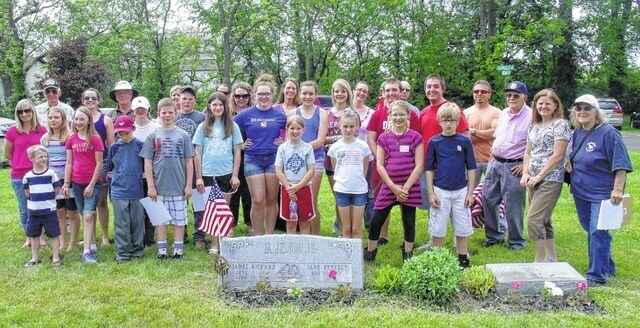 Big Walnut Area Historical Society member Susanne Allen, a Sunbury Halter & Saddle 4-H Club adviser, has encouraged club members to participate in an ongoing project to place veterans markers and flags at the graves veterans in area cemeteries. This year, leading up to Memorial Day, Sunbury Halter & Saddle members joined forces with Sunbury’s Col. Benson W. Hough American Legion Post 457 to place markers and flags on the graves of World War II soldiers at Sunbury Memorial Park, the village-owned and -maintained cemetery. During the casual May 24 ceremonies at each veteran’s grave site, club members read a brief statement about each WWII soldier while flags and markers, provided by Post 457, were placed on each grave. Following the ceremonies at the cemetery, members of Sunbury Halter & Saddle 4-H Club hosted a potluck supper at Sunbury Town Hall and invited American Legion veterans who participated in the service. Allen said that, if any veterans have been missed in eastern Delaware County cemeteries and need flags and markers, to contact her through the Big Walnut Area Historical Society (bigwalnuthistory.org).